Local Matters is a non-profit organization founded in 2008 that teaches children and families what healthy food is, where it comes from, how to grow it, and how to access it affordably. Although, they are located in Columbus they have already grown to reach additional satellite partners with their Cooking Matters program in Toledo; Delaware, OH; Newport, KY; and Cincinnati. The proprietary nature of their curriculum allows them to train satellite partners and expand their reach. Their mission is to create healthy communities through food education, access and advocacy. They do this by teaching children and adults about healthful food. Local Matters has delivered lessons to more than 80 sites across Columbus, reaching more than 11,000 individuals annually. Most of their programming takes place in at-risk neighborhoods, providing a solution to food insecurity through increased access to healthy foods in tandem with nutrition education. Their Food Matters and Growing Matters programs work with children and youth in a variety of settings (schools, partner nonprofit organizations, recreation and parks) to get participants excited about food and to teach them how to grow food and how to prepare it. Within their curriculum they inform students about Ohio grown foods as well as providing geography, plant science, and multi-cultural lessons. Local Matters believes the relationship between knowledge of healthful foods and increased access to them as a solution for hunger and diet-related chronic disease. 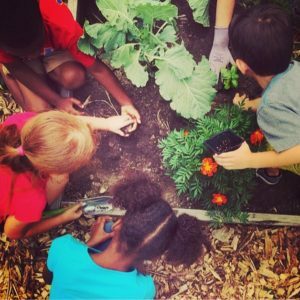 Their work makes the connection that farm-to-school means food in our garden or from a local farm, and the likelihood of children eating locally (from farms or gardens) can be increased if they are part of the growing, harvesting and eating process. They also provide summer programming with Columbus Parks and Recreation and other locations having summer feeding sites. Their learning gardens are a tool for community engagement, unifying neighborhoods around a common goal and providing an educational experience and sustainable food option for children, youth and adults. Students are excited to watch food grow from seed to fruit and into a meal. All students are encouraged to try new foods and they report overwhelmingly positive feedback on the many plant-based dishes. The learning gardens grow vegetables suitable to Ohio’s climate, like tomatoes, ground cherries, kale, arugula, onions, Brussels sprouts, cabbage and more. Students are introduced to kale chips, pasta, salads, including a Three Sisters Salad – a bean, corn and squash medley that incorporates food history and gardening techniques. Another example of a partnership is with the YMCA collaborating on a garden for a Bhutanese-Nepali population within the Northland neighborhood. Our team worked with leaders to identify plants that would grow well in Ohio and respected the community members’ cultural preferences. In partnership with Godman Guild’s summer employment program with twelve at-risk youth, they provide experiences that provide lifelong skills and a long-lasting impact. Community collaboration enables them to reach those with the greatest need. We can make a larger and longer lasting impact through shared resources and expertise. Food Matters and Growing Matters work most directly with children and youth, but their impact extends to the entire family. “We have heard parent feedback about the Food Matters program (stating) changing eating habits (in the) home. Weekly updates are sent home with the students including the regions or topics that were the focus, as well as the recipe for food that was prepared or tasted. Parents were then able to have conversations with their children about the lessons and prepare the food at home which increased exposure to new healthy foods,” said a Bridgeway Academy teacher. Local Matters has created positive experiences for children, helping them associate fruits and vegetables with fun. “To hear my son say, ‘broccoli is good for you and I like broccoli’ was amazing because he (once) refused to eat vegetables,” a Food Matters parent said.